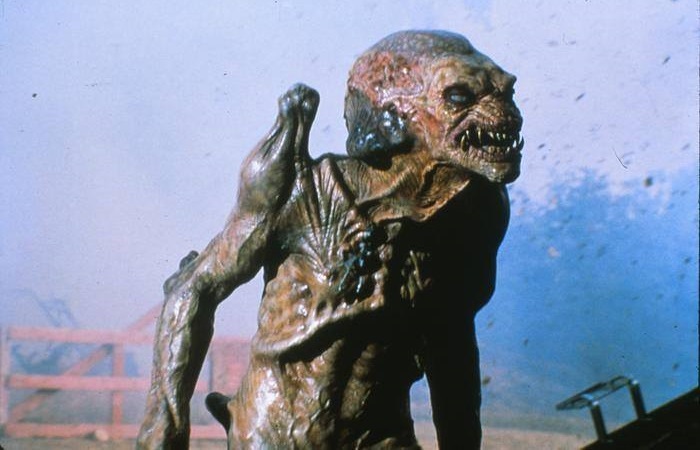 Pumpkinhead concept by Alec Gillis. 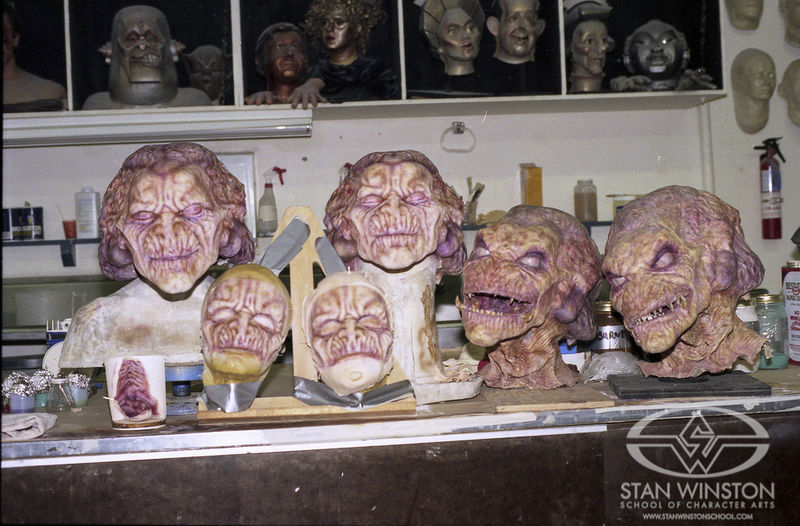 Various designs were considered, with the final Pumpkinhead taking elements from all of the previous iterations. 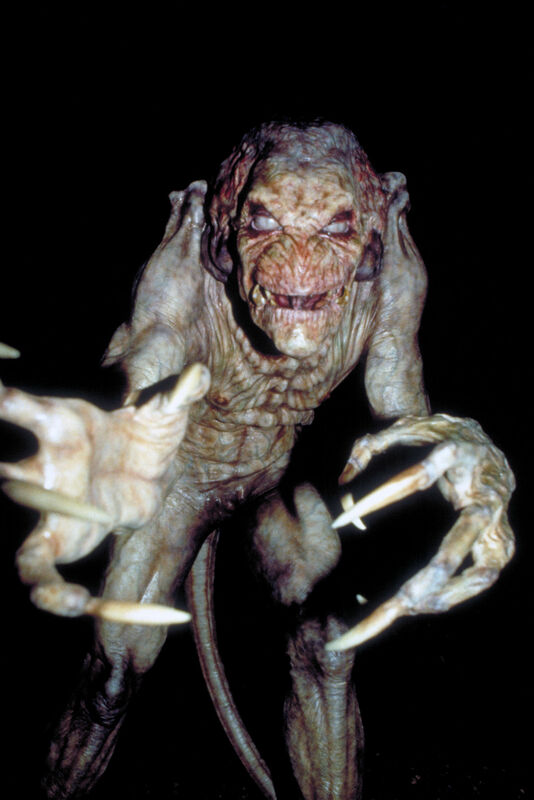 The creature features overgrown bones on its shoulders and legs, long and skeletal fingers, and pale eyes with slit, reptilian pupils — almost unnoticeable in the film. “They just used their own initiative,” Gerani said, “and said, it’s a demon. What doesn’t look conventional or corny? 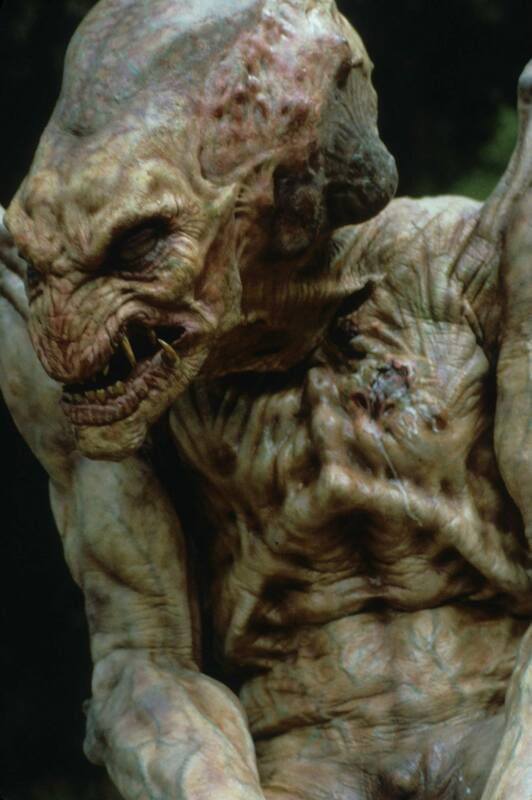 They eliminated horns but thrust up his shoulder blades to convey it in an interesting way.” Completing Pumpkinhead is its namesake bloated cranium. 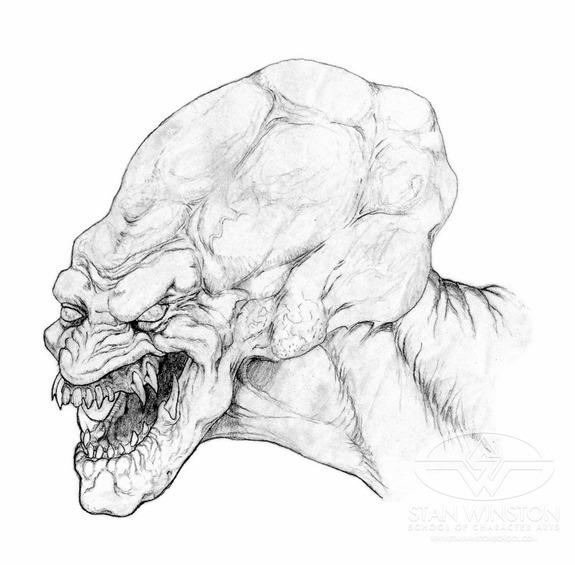 Its color scheme also reflects its nature, with hues based on decaying flesh. 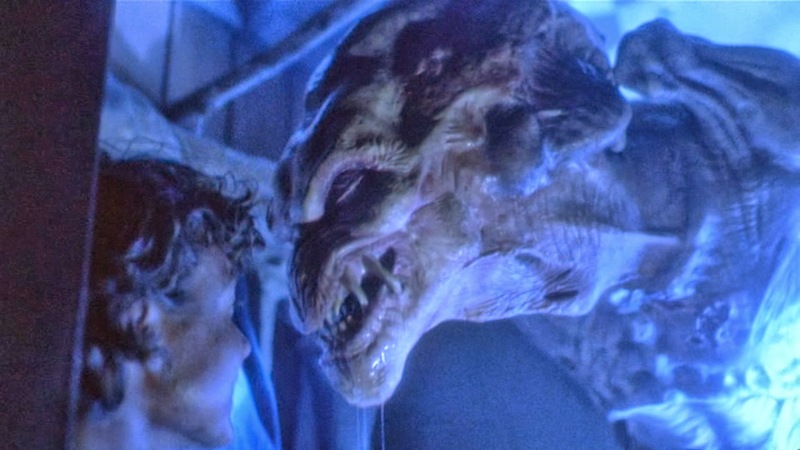 Pumpkinhead was also portrayed as growing from a fetus-like stage which is unearthed to begin the summoning. Winston’s limited collaboration also eased the process. “There was a shorthand with Stan that made it so easy,” Rosengrant related. “We could go to him with something, and ask: ‘is this enough? Will this do it?’ And he could look at it, and immediately say, ‘yeah, that will be fine,’ or, ‘no, we need more.’ That’s very different than the normal situation where we have to overbuild, just in case the director changes his mind and wants something more once he is on the set. Stan knew exactly what the tools were, what he needed and what he didn’t need. We didn’t have to go through the process of educating him, as we do with many directors. 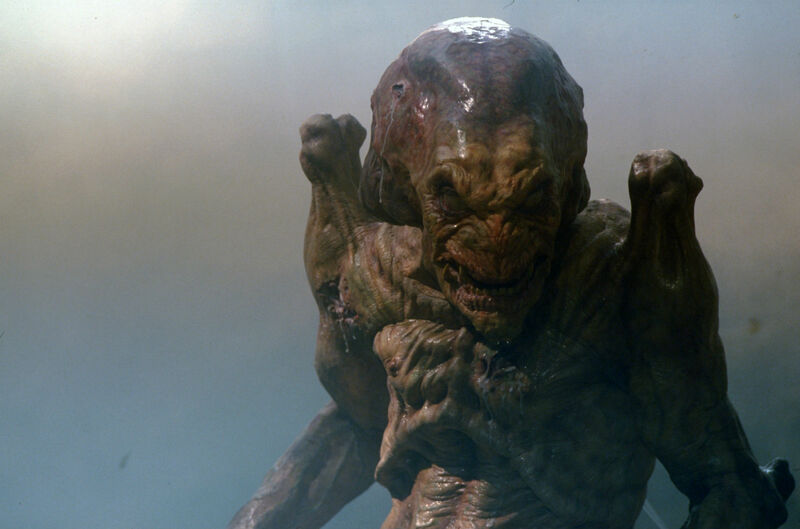 That made the whole job easier, and a lot more fun.” With the final design selected, construction of Pumpkinhead began. 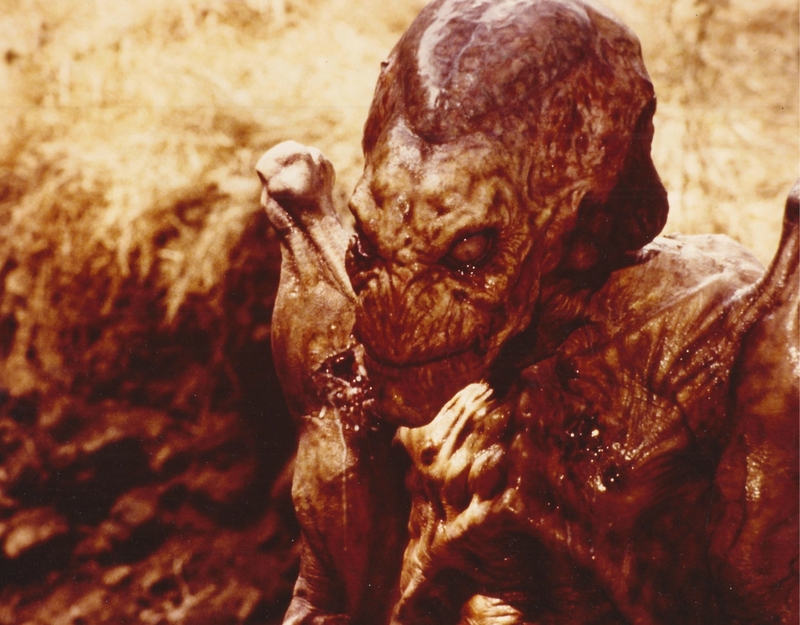 The fetus stage was sculpted by Alec Gillis and John Rosengrant and painted by Tom Woodruff, Jr.; it was built as a featureless dummy covered in dirt, as well as a simple cable animatronic that could rear itself. 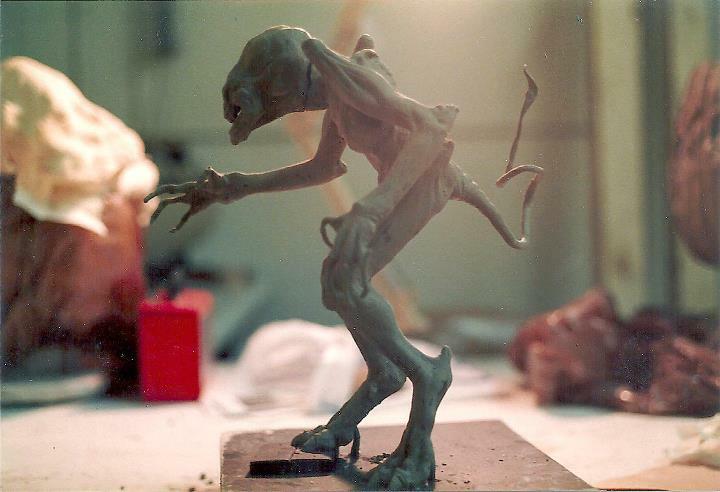 A second stage, seen only in one single shot of the film, was also sculpted and painted by Shane Mahan. 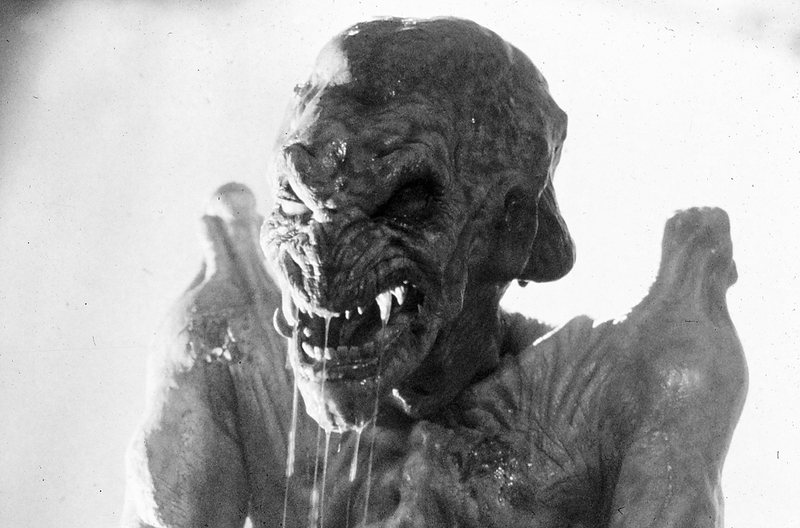 The final stage Pumpkinhead was sculpted by Alec Gillis (for the head), and Tom Woodruff, Jr. and John Rosengrant (for the body). 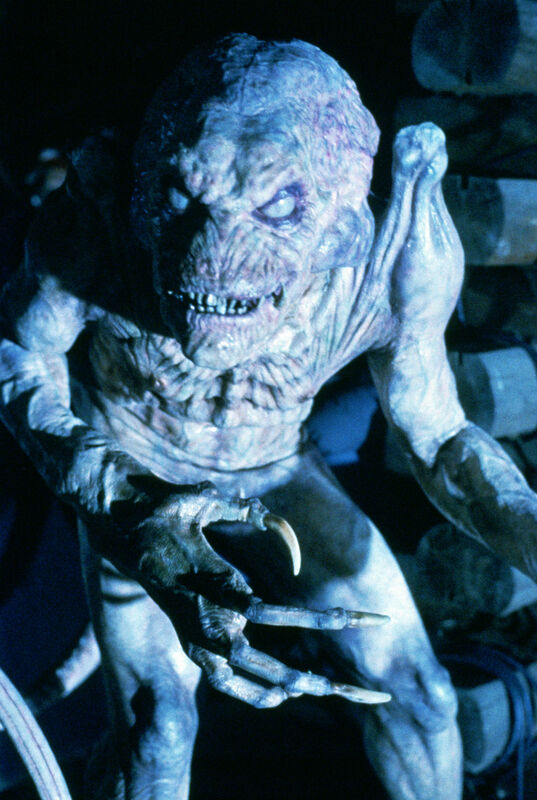 Rosengrant and Howard Berger painted the creature, which was built as a full-size suit, performed by Woodruff. 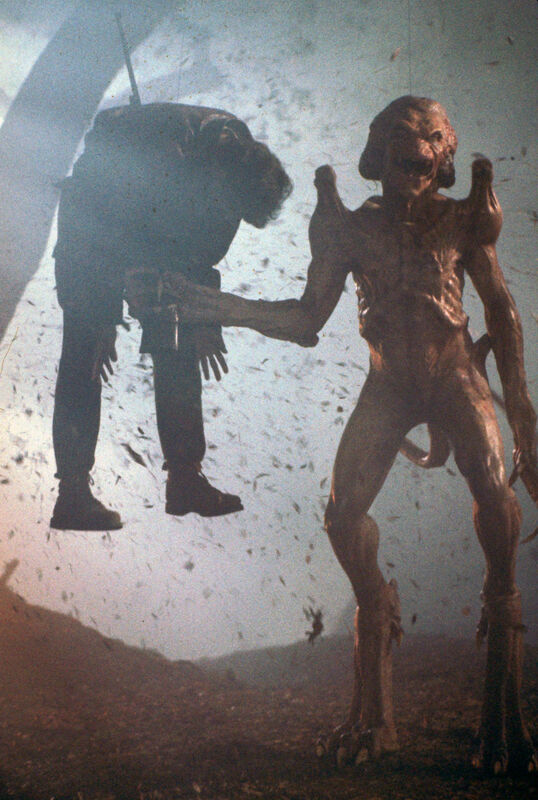 The skin was cast in foam latex, with spandex embedded to enhance the suit’s durability, whereas the claws were cast in translucent resin. 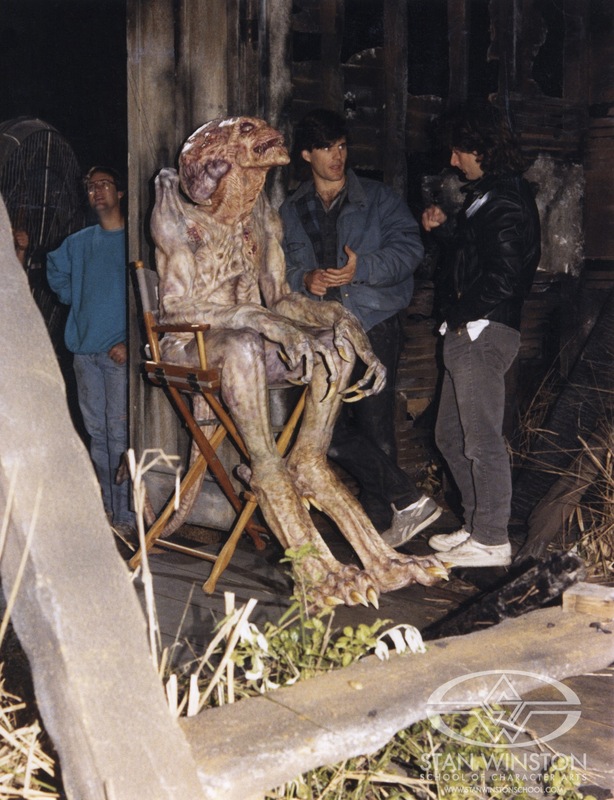 For reasons of budget, the creature suit’s hands were poseable, but not articulated; two insert animatronic arms were thus constructed by David Nelson. 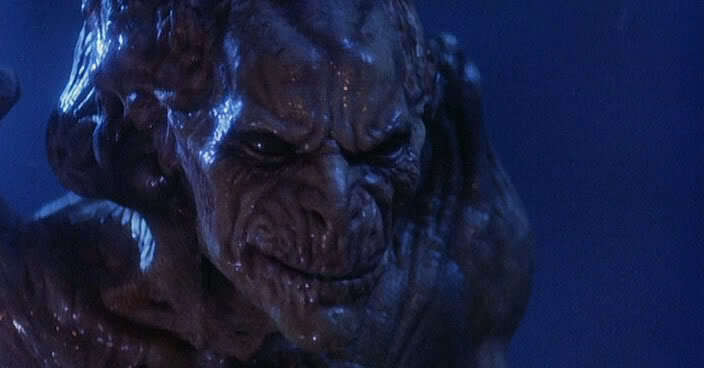 In the end of the film, to illustrate the creature’s bond with the farmer, Pumpkinhead’s face mutates into a more humanoid configuration, reminiscent of Ed Harley’s face. 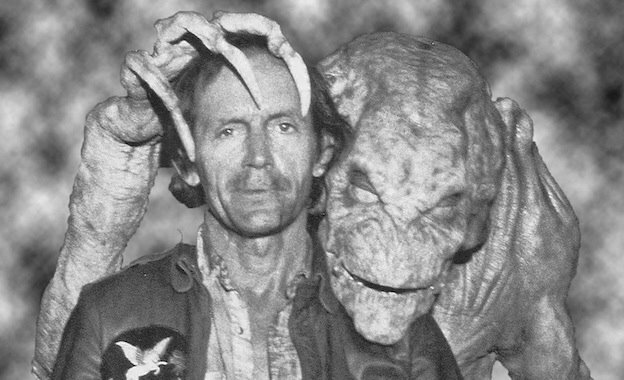 Again, a hero head and a stunt head were built; John Rosengrant sculpted the new face, infusing traits and connotations from Lance Henriksen into its appearance. 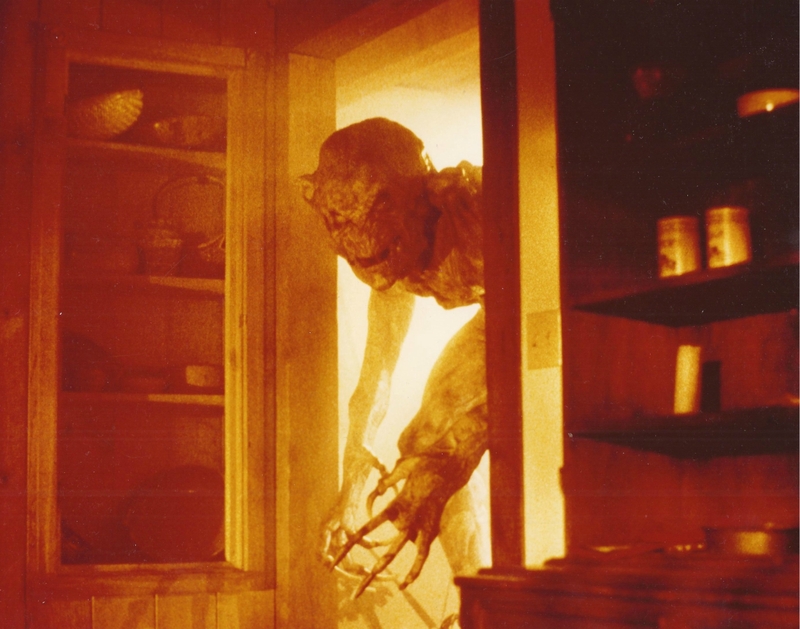 Ed is ultimately damned to become the next Pumpkinhead — and is seen being buried as a deformed fetus, which was created as a featureless dummy, sculpted to include Henriksen’s features. 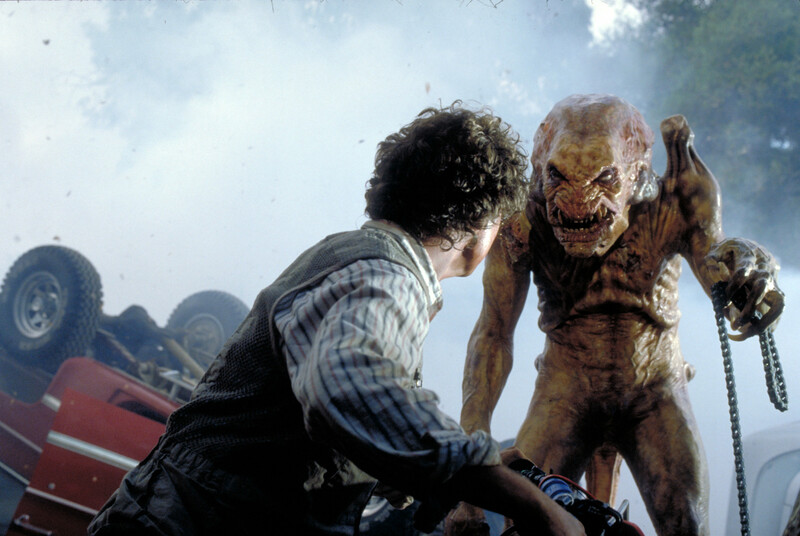 For more images of Pumpkinhead, visit the Monster Gallery. 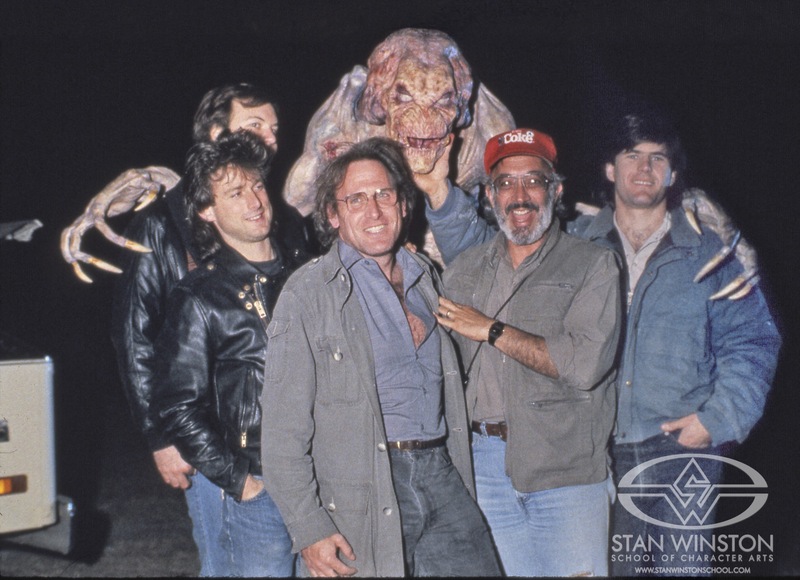 Posted on 06/10/2014, in Movie Monsters and tagged Pumpkinhead, Stan Winston. Bookmark the permalink. Leave a comment.